Library Park's redesigned space, for which construction will commence the week of July 16, 2018. 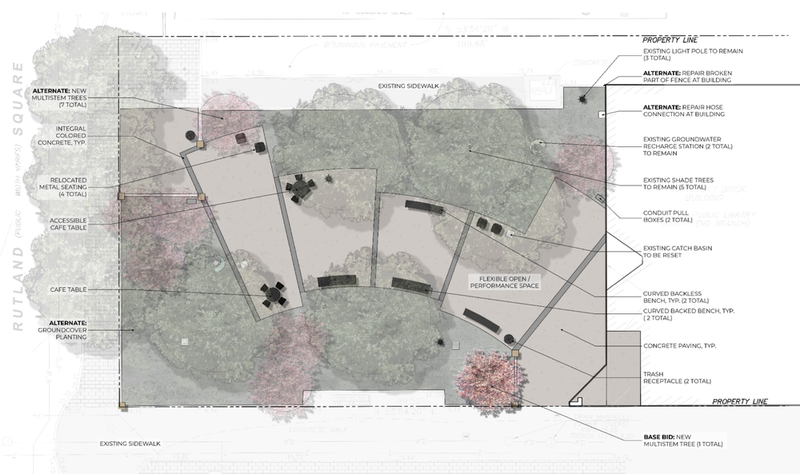 In addition to the design above, enthusiastically approved by the South End Landmark District Commission in April, the work will include major infrastructure work to remove any obstacles still buried underneath from the early 1970s when it was first built, and re-grade the park's surface. Library Park in its previous state, with a large area of broken pavement and limited usage options. The new design, featured above, will have multiple seating arrangements. The construction, which began late July, may take three months. The Friends of the South End Library (FOSEL) is very happy to report that, late last week, capital funding of $400,000 was restored in the FY 2019 budget for Phase Two of the South End library's interior renovation. This means that our efforts to quickly improve a cramped and outdated branch by means of a pubic/private partnership between the Boston Public Library (BPL) and FOSEL will succeed. It is the first partnership for a Boston branch library in the history of the BPL in which private contributions raised by FOSEL from local library supporters combined with a dedicated BPL capital allocation is used for an accelerated library renovation. In addition, money was added to the Parks Department budget to start the reconstruction of Library Park. The current 2019 city budget, linked here, shows two capital allocations for the South End branch, $100,000 for a program study leading to a major overhaul and expansion of the library; and $400,000 to be spent on short-term improvements outlined in Phase Two. Both projects will be subject to public hearings. The proposed redesign for Phases One and Two is illustrated in the drawing above. Further details are on our website, linked here. There are many people to thank, but first and foremost Mayor Marty Walsh, who visited the library several times since his election and each time pledged his full support for the branch's renovation, and for the redesign of the library's adjacent green space, Library Park. 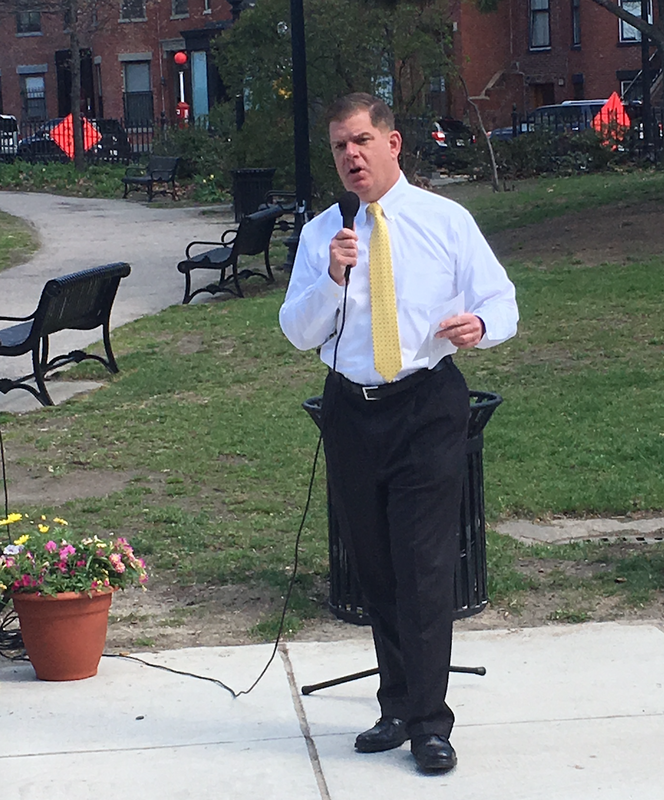 This spring, both library and park projects were suddenly delayed, each for different reasons, but both were put back on track with the same solution: the Mayor's strong support for more funding for these two important and long-neglected civic spaces in the South End. The unwavering efforts on our behalf by District 2 Councilor, Ed Flynn, was another key factor. Flynn and his staff rallied the South End's other two councilors, Frank Baker (District 3) and Kim Janey (District 7), and all at-large councilors (Michelle Wu, Ayanna Pressley, Annissa Essaibi-George and Michael Flaherty), to sign their letter requesting the necessary funding from BPL President David Leonard and Mayor Walsh. Flynn met separately with the Mayor, as well, to plead FOSEL's case. The signature of City Council President, Andrea Campbell, who grew up in the South End, moreover, was at the top of the list. Faisa Sharif, the South End's liaison to the Mayor's Office, performed a yeoman's job going through the budget details with David Leonard to secure city dollars for park and library, and kept FOSEL in the loop at all times. Our State Rep., Byron Rushing, a BPL trustee since 2009, assured audiences at several South End events recently that 'all would work out fine.' Did he know something we did not? Who knows: He was right. Our BPL partner in the public/private enterprise, President David Leonard, has reached out to us to plan the next steps in the library project in meetings that will include Faisa Sharif, Ed Flynn and Byron Rushing. We are looking forward to continuing our productive relationship to benefit the South End library and its users. You will be kept apprised of important details. Last but not least, we thank you, our loyal supporters, and every member of the FOSEL board, for emailing and phoning our elected representatives and the BPL. The turnaround could not have happened without you.